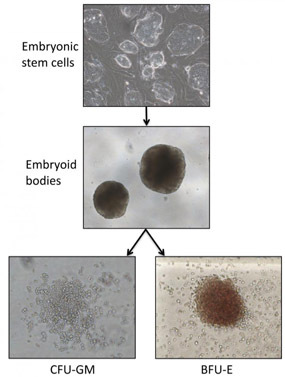 Pluripotent cell lines can be differentiated into various blood cell types via the process of embryoid body formation. The burst-forming erythroid unit (BFU-e) comprises a type of red cell progenitor while the colony forming unit granulocyte-macrophage (CFU-GM) is a bi-potent myeloid progenitor cell capable of making both granulocytes and macrophages. During embryonic development, HSCs are generated from pluripotent cells in a series of progressive differentiation steps. This process can be modeled in vitro by directing the differentiation of pluripotent cell lines, such as embryonic stem (ES) cells or induced pluripotent stem cells (iPSCs), towards the formation of the hematopoietic lineages. The in vitro specification of hematopoietic lineages from ES cells and patient-specific iPSCs closely mimics the process via which HSCs are generated during development, and holds enormous potential for disease modeling and for the eventual scalable production of differentiated cells for regenerative therapy. However, a number of differences exist between the normal developmental process and the in vitro differentiation procedure. The most notable of these differences is the current inability to generate in vitro, HSCs that have the same functional properties as their in vivo specified counterparts. 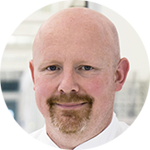 One of the current focuses of the Experimental Hematology group is to better understand the important molecular and biological differences between hematopoietic specification in vitro and in vivo, and to attempt to apply this knowledge towards developing better methodologies for the generation of functional HSCs from ES cells and iPSCs. 1. §Müller L.U.W., §Milsom M.D., Harris C.E., Vyas R., Brumme K.M., Parmar K., Moreau L.A., Schambach A., Park I.H., London W.B., Strait K., D’Andrea A., Daley G.Q. and Williams D.A. (2012). 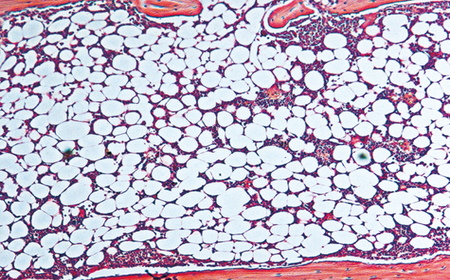 Overcoming reprogramming resistance of Fanconi anemia cells. Blood. 119 (23): pp5449-57. §Equal contribution. 2. Ghiaur G., Ferkowicz M.J., Milsom M.D., Bailey J., Cancelas J.A., Yoder M.C. and Williams D.A. (2008). Rac1 is essential for intraembryonic hematopoiesis and for the initial seeding of the fetal liver with hematopoietic progenitor cells. Blood, 111 (7): pp3313-21.